Student tutors, donors and leaders gathered to reflect on the program's impact this spring. St. Louis-based Maritz, a company that assists some of the world’s largest corporations to engage and inspire their employees, partners and customers, has awarded a $15,000 grant to Webster University’s Student Literacy Corps and the Math Tutoring Program. The grant will support the work of student tutors during the 2018-2019 academic year. “We are very grateful for the continued support and partnership with Maritz,” said Kate Northcott, director of the Student Literacy Corps program. “This grant will ensure that Webster students can continue to tutor and that struggling readers will continue to enjoy the additional support and encouragement tutors provide. The Student Literacy Corps started as a service-learning project in the School of Education at Webster University in 1990 and has grown to include Webster University students from all disciplines. It enables University students to serve as reading tutors at elementary and secondary schools across the region, as well as social service agencies, with the goal of inspiring learners to better enable them to create their own success in school and the workplace. Maritz has helped fund the program annually since 2011. Maritz is a sales and marketing services company, which helps companies achieve their full potential through understanding, enabling, and motivating employees, channel partners and customers. Maritz provides marketing and customer research; communications; incentive initiatives; rewards and recognition programs; meeting, event & incentive travel management services; and consumer loyalty programs. Maritz demonstrates its commitment to human potential by supporting educational endeavors in our community. For more information, visit maritz.com or call 1-877-4MARITZ. 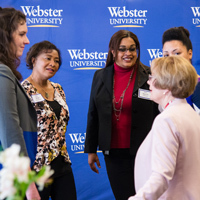 Webster University’s Student Literacy Corps is a community service program through which Webster students are trained and placed as reading tutors in St. Louis-area schools. Created in 1990 by School of Education faculty members Dr. Jeri Levesque and Dr. Theresa Prosser, the program celebrated 25 years in 2016 with over 700 Webster University student tutors having reached over 10,000 students. While the program originated in the School of Education, tutors have come from every school on campus.